To view our Portfolio of Custom Special Event Apparel, just click on the project names to the left. The custom t-shirts we make are keepers. They keep memories of a time, place, and feeling. So leave the recollection (and branding) of your event in great hands by working with Evan Webster Ink. Your friends, family, customers, and colleagues will receive apparel they love to wear. It will be the first item they grab when the wash is done. Week after week, year after year. In addition, we make sure your life is as easy as possible by using a consultative ordering process resulting in high-quality apparel within budget and delivered on time. 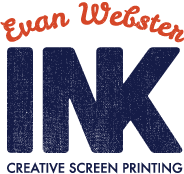 Whether your event is big or small, collaborate with Evan Webster Ink to make apparel that will provide a lifetime of comfort and memories. Whether your event involves running through fire on mountain tops or simply walking for a cause, we’ll help find the perfect product to print a design that is you. If it’s your 1st Annual or 27th Annual, we have tips and tricks to make everything easier and keep costs within budget. It doesn’t matter to us if your event takes place in rural Charlotte,Vermont or bustling Downtown Boston – we’ll get your apparel to you on time. Email us now to get started. Or dial our telephone number: (802) 222-0344.